Once the wool is off the sheep and the really yucky parts have been removed, the next step is to wash it until its nice and clean. 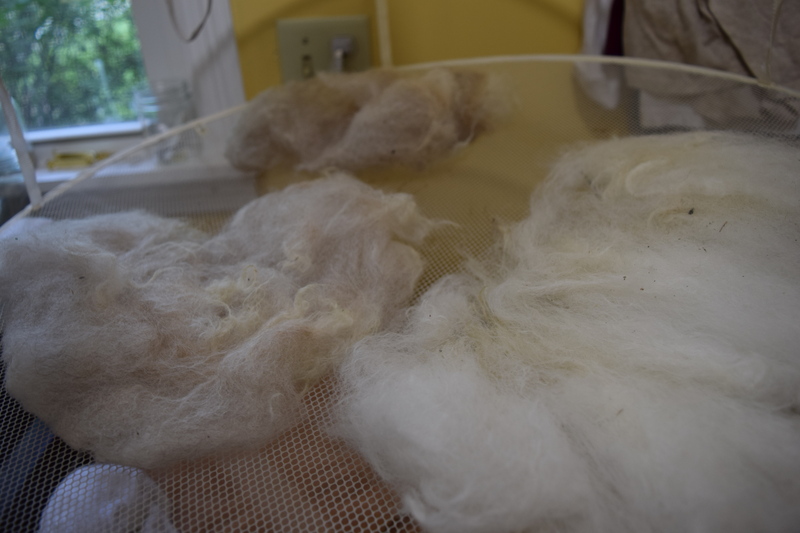 There are many different ways to wash raw wool but I’m going to tell you about the way that I usually do it. You will need a large sink or wash tub, dish washing soap (I use blue Dawn ), thick rubber gloves, some raw wool and lots of hot water. You’ll also need something to put the wet wool on to dry- I use sweater drying screens but you can lay your wool out on a towel. Step 1: Separate your fleece into manageable chunks. 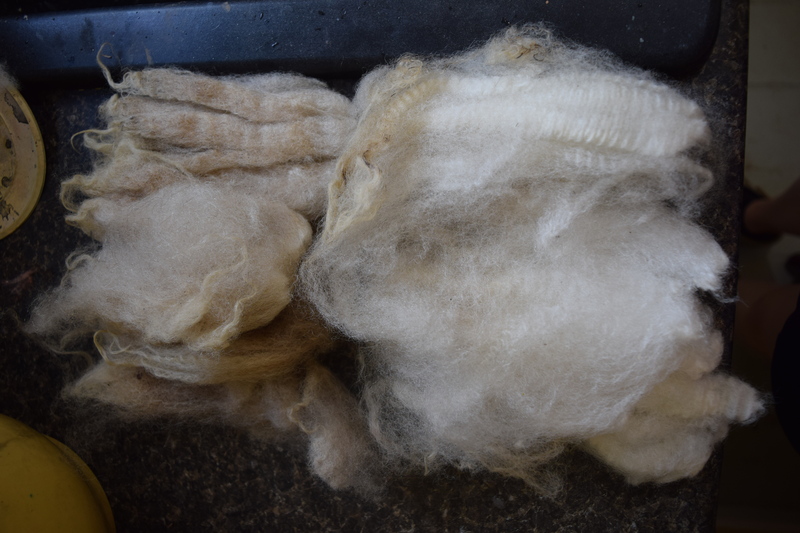 I find that its easier to wash the fleece in sections rather than try to wash the entire fleece at once. 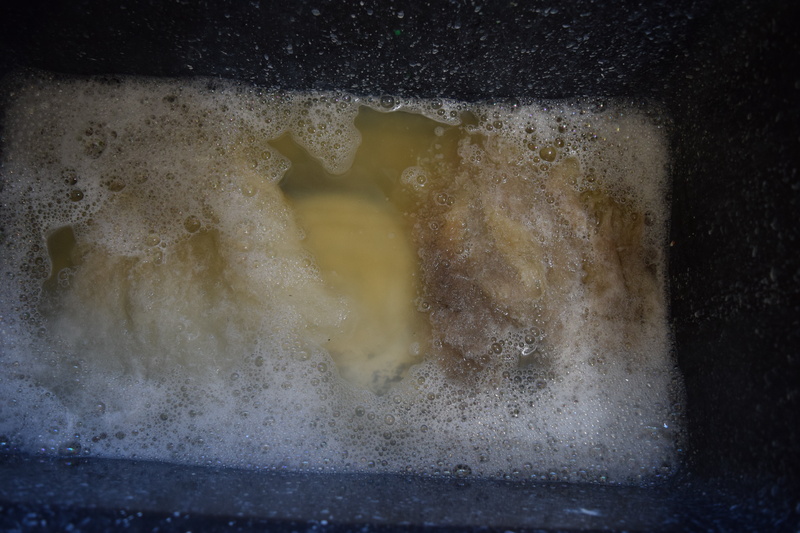 Step 2: Fill your wash tub with really hot water and a squirt or two of dish soap. Our tap water is really hot so I use that, but if your tap water doesn’t get hot enough you can boil water on the stove or microwave and add it to the tub. This is why the thick rubber gloves are important- you want your water to be too hot to comfortably stick your bare hands in. Gently lay the wool in the tub and push it down with your hands or a wooden spoon. Do NOT agitate the wool or else it will felt. Instead, push it under the water until its full saturated and let it soak. 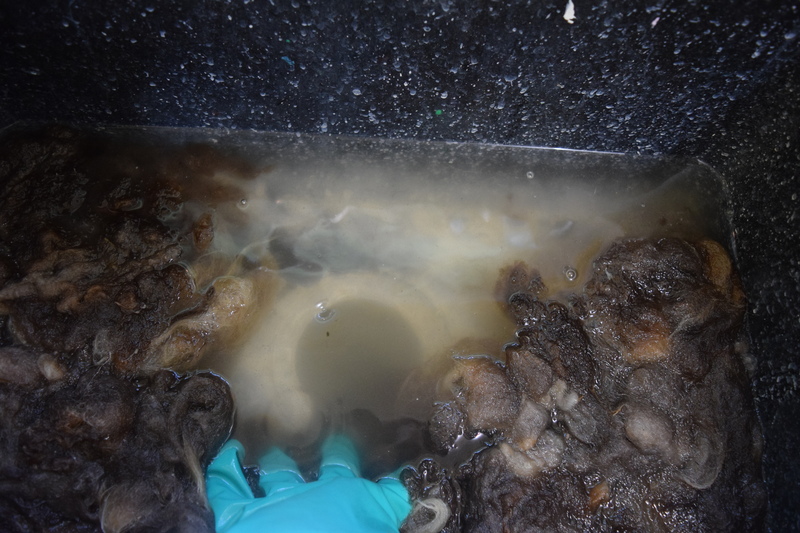 Gently swirl the wool under the water to help loosen the oils and dirt. You’ll probably see a lot of yellow or brown in the water. 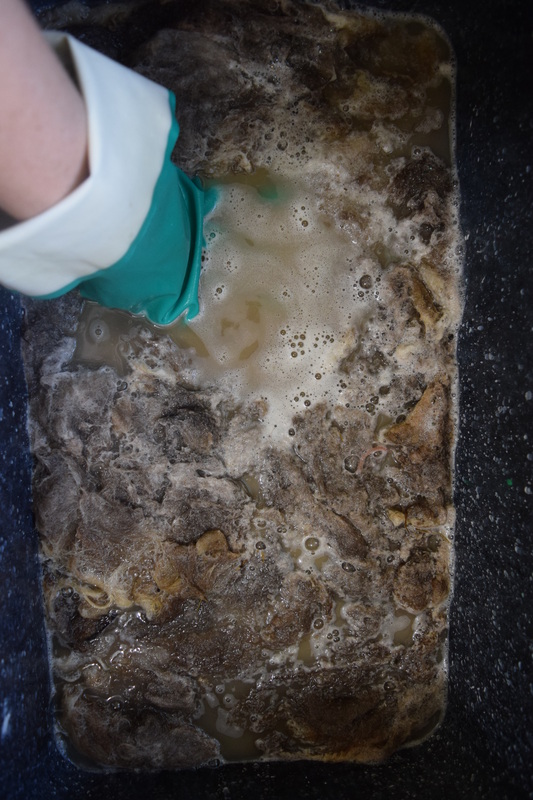 Step 3: After soaking for a few minutes, but before the water cools to room temperature, gently lift the wool out of the tub and drain away the dirty water. Step 4: Repeat steps 2 and 3 until you no longer see brown or yellow streaks in the water. On some fleeces it will only take one soak, but others will take several. 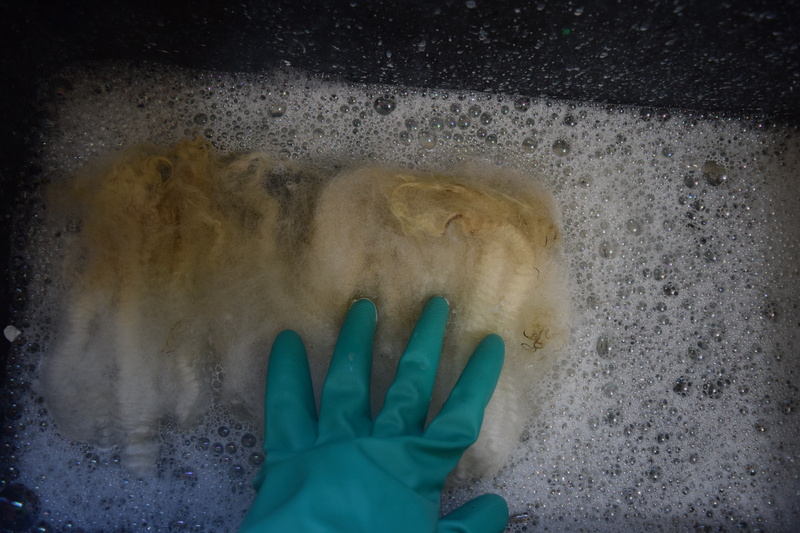 It depends on how dirty the fleece is, how much lanolin the sheep produces, how hot your water is and how much wool you are washing at once. Clear water means the wool is clean! 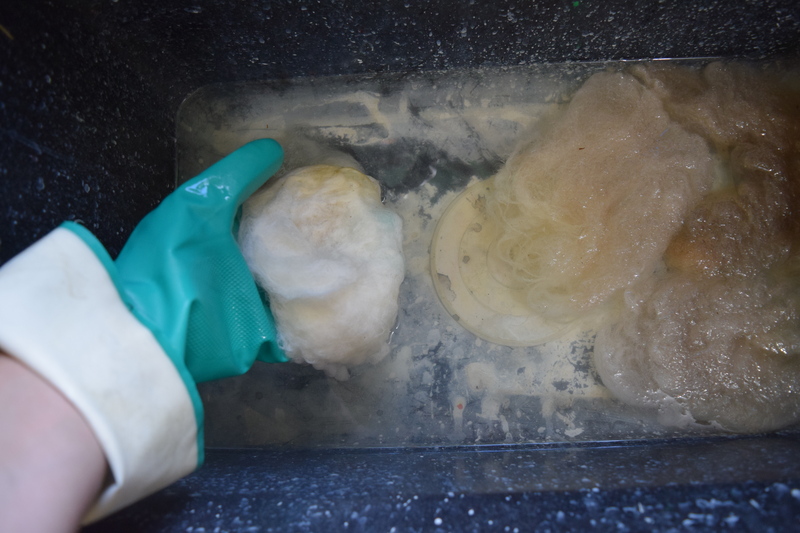 Step 5: Once the wash water looks clean, soak the wool one more time in hot water but this time don’t add any soap. If you used a lot of soap, you may need to soak more than once to get rid of all the soap. Rinse until there aren’t any bubbles left. For larger batches of wool, gently hold the wool to the side to let the water drain. Step 6: Now you have nice, clean wool but its very wet. Gently lift the wool out of the wash tub and press the extra water out. Do not wring, twist or rub the wool. 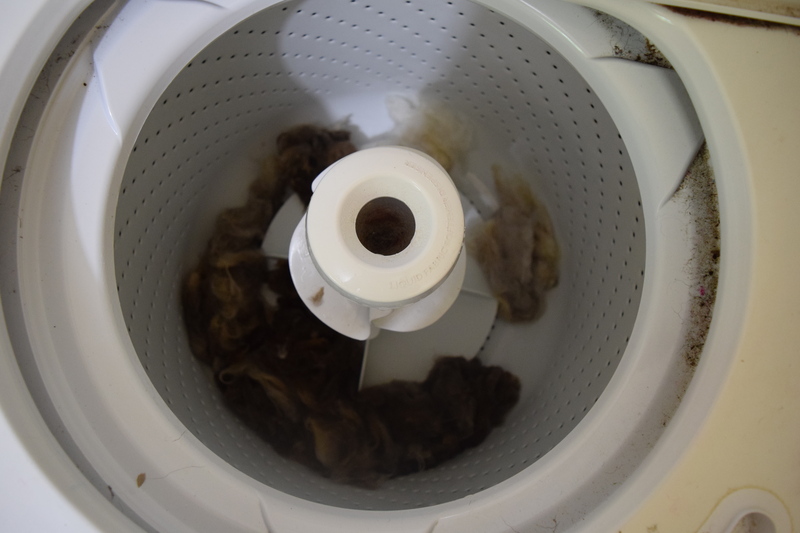 If you are in a hurry or have a large amount of wool to dry, place your wool in a top loading washing machine and run it through the spin cycle. Be careful that it ONLY SPINS the wool and doesn’t add water or agitate. Spin the wool out until it is damp but no longer dripping. For smaller amounts of wool, you can do the same thing using a salad spinner or you can wrap the wool in a towel and press out as much water as possible. 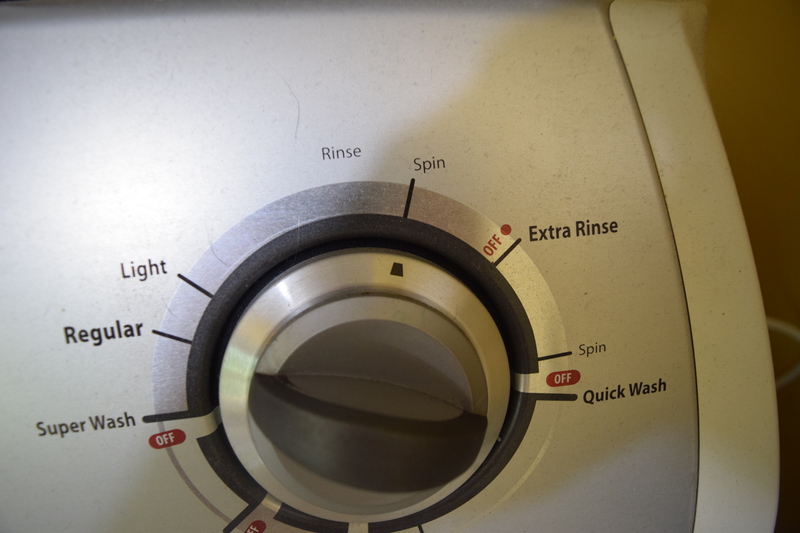 Make sure to select the SPIN CYCLE only! No washing, rinsing or agitating. 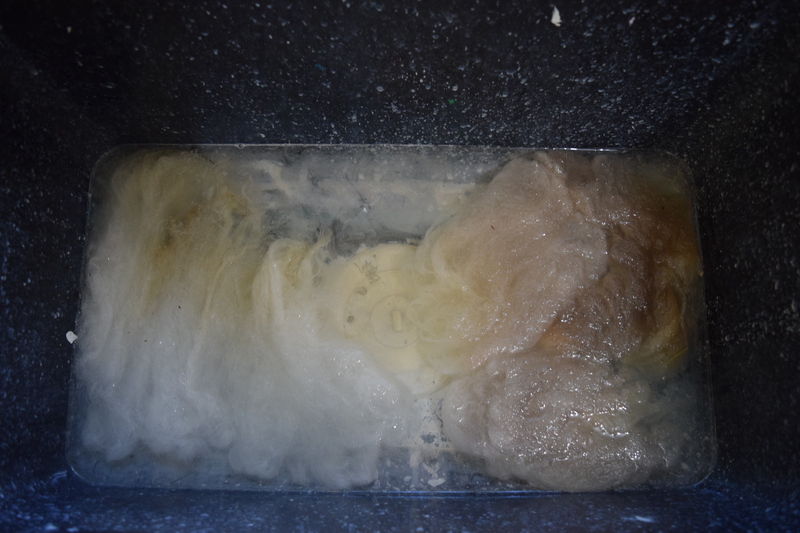 Step 7: Once you’ve removed as much extra water as you can, place your washed wool on a drying screen or towel to dry. It will dry faster in the sun but be careful that it doesn’t blow away! Next up: Combing and Carding!